It is likely that the Scottish highlanders developed the bagpipe at a very early date, independently of other forms of pipes (e.g. Roman). 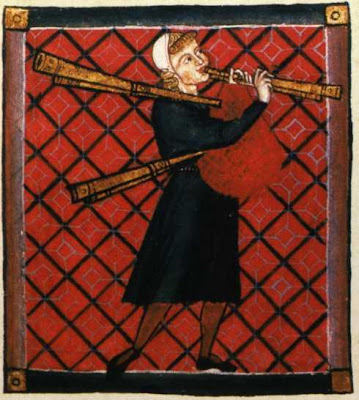 Illustrations and carvings from as early as the 14th century show an instrument that we can clearly recognise as a true bagpipe. It often had only a single drone. The smallpipes, a variety of bagpipe, are a true Scottish folk instrument and their history can be traced well back into medieval times. They are also known as ‘parlour’ or ‘fireside’ pipes as they are suitable for indoor playing. Unlike the well-known highland bagpipes, or war pipes, the Scottish smallpipes were never adopted by the army and so were not banned by the English authorities at the time of the Jacobite rebellion in the 1740s. Still, their use gradually declined until, by the mid-1970s, they were almost extinct. However, the Scottish smallpipes have gone through a huge revival in the last ten to fifteen years. There are now many configurations of smallpipes available in a range of keys. there are note extensions that allow for the playing of some medieval and renaissance music.